Cumbernauld Colts celebrate Owen Ronald's early match winner against Leith. Cumbernauld Colts are through to the next round of the Scottish Cup after a narrow win over Leith Athletic at Broadwood. An early header by Owen Ronald was enough to see Colts past East of Scotland champions Leith Athletic in their first round replay and book a tie with Highland League Forres Mechanics later this month. Leith survived an early scare when Ritchie Kirwan’s driving run and cross was met on the volley at the back post by Ronald, but Neil Fairney managed to divert it wide via the post. The first match had ended in a goalless stalemate but in the end Colts didn't have long to wait before scoring the one goal which would settle the tie. With just 10 minutes on the clock Stephen O’Neill’s driven delivery from the left was glanced home by Ronald, leaving Fairney with no chance. The Lowland League side looked the more dangerous, Craig Murray bursting in to the box but he sent his shot straight in to Fairney’s arms. After the interval Ronald was almost gifted a second when Fairney allowed a pass back to slide through his legs, but he was bailed out by captain Sean Melvin, who cleared for a corner. Colts substitute Jamie Broadfoot almost put the game beyond doubt with this first involvement. Starting the move in midfield, he fed O’Neill before haring towards goal for the return pass. He beat Melvin to the bouncing ball, but could only lift it over the on-rushing Fairney and the crossbar. A high effort from O’Neill and a tame Andy Selkirk header were the only real attempts for a spell as the game moved in to the last 15 and Leith began throwing men forward. Colts were perhaps fortunate to keep 11 on the park when Kirwan appeared to aim a slap at Melvin after a coming together on the touchline, following the visiting defender’s surge forward. 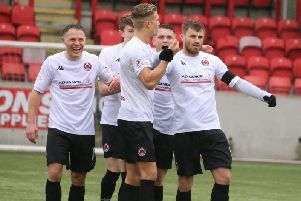 They should have made sure of progression to the next round when Andy Black saw his header tipped on to the bar by Fairney and Jamie Barclay somehow fired the rebound wide from around eight yards out. But with Leith failing to trouble Chris Fahey to any great degree the Cumbernauld side always looked comfortable seeing the game out despite the narrow scoreline.